Type 1 Diabetes Causes: What Causes Type 1 diabetes? 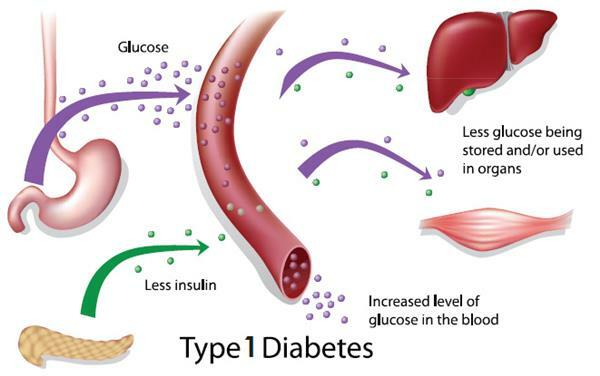 Type 1 diabetes is an autoimmune disease that is caused by a lack of insulin. The reason behind this occurrence lies in the destruction of the pancreas beta-cells that produce the insulin. As type 1 diabetes is an autoimmune disease, the immune system attacks the body’s cells. There are many causes for the development of type 1 diabetes. Let’s have a look at the known type 1 diabetes causes. Genetics play an important part in the development of type 1 diabetes. The genes are being passed down from parents to their children and they may or may not carry instructions for developing this particular disease. The instructions all genes carry are those of making proteins the body needs to function. Many influence susceptibility or protection from this disease. The genes are known to vary according to different groups of population and these particular variations can affect approximately 1 percent of a population group. They are also referred to as gene variants. There are certain gene variants that carry different instructions for making proteins. These genes carry instructions for making leukocyte antigens on white blood cells. Those in term are directly linked to type 1 diabetes. These human leukocyte antigens can help determine if the immune system will be able to recognize the body cells and accept them as their part. In some cases, they may recognize these cells as some kind of a foreign material. Certain HLA combinations can help predict if a person is at risk of developing type 1 diabetes. Others can help predict if the person is protective or the HLA genes variants are not risk for developing this condition. Aside from the HLA genes, which are known to be the major risk genes for this type of diabetes, there are also many other risk genes or regions. These genes can help identify the people who are at higher risk for developing this disease. Additionally, they can help experts find clues to better understand the developing process of type 1 diabetes. If this is done, there is bigger probability that researchers will find potential therapy or even prevention. Hereditary testing is a complicated matter, but they can show the types of HLA genes that a person carries. Additionally, these may help uncover some other genes that can be linked to type 1 diabetes. However, the generic testing is usually done in a setting for research, not available to individuals. Right now, we have to leave this job to the scientists. They are constantly trying to understand how genetic testing can help improve both type 1 diabetes treatment and prevention options. If you are wondering what causes type 1 diabetes, the answer probably lies in the white blood cells that are called T cells. These cells can attack and destroy the beta cells. The process of destroying beta cells starts long before the first type 1 diabetes symptoms appear. This process is lasting after the diagnosis of the patient. In most cases, type 1 diabetes cannot be diagnosed early and this usually happens after the majority of beta cells are already destroyed. This is why most patients need to get insulin daily dosages in order to maintain sugar levels and survive. It is quite clear why the main focus of scientific research still remains on uncovering the best way to modify or prevent this autoimmune process – to preserve the beta cells function and save people from the trouble of having to take daily insulin dosages every day. There are some recent researches that suggest insulin is also a key trigger of the beta cells attacks. People who are susceptible to developing this disease have an immune system that responds to insulin as it would with an antigen (foreign substance). When this happens, the body starts making antibodies to fight and combat these antigens. These antibodies are found in type 1 diabetes patients and are constantly tested in order to help identify the people who are at increased risk of developing this particular disease. Testing the antibodies, especially their types and blood levels can help understand and determine which people are more likely to develop type 1 diabetes. These factors include foods, viruses, infections and toxins. The environmental factors can play a grand role in the development of type 1 diabetes. However, the exact nature of this particular role is still not confirmed or fully determined. There are some theories that suggest that the autoimmune beta cells destruction is triggered by environmental factors, especially in cases of people who are more susceptible to developing type 1 diabetes. On the other hand, other theories suggest that these causes of type 1 diabetes play a role in diabetes, after the person has been diagnosed. It is a known fact that a virus does not cause this autoimmune disease on its own. However, it has been proven that people are often diagnosed with the disease while suffering from a viral infection or after its treatment. This suggests a clear link between viruses and type 1 diabetes. Another reason for believing in this connection is the type 1 diabetes onset. This onset occurs more frequently during the winter periods, known for the increased cases of viral infections. According to scientists, there are several ways for these viruses to destroy or greatly damage the beta cells and increase the risk for type 1 diabetes in cases of susceptible people. People with congenital rubella syndrome are connected to this disease due to the recent findings of anti-islet antibodies in their bodies. Additionally, cytomegalovirus has been associated with beta cell damage and pancreas inflammation. If scientists manage to identify a virus that can be ascertained as a type 1 diabetes cause, they may be able to find a vaccine that will serve as prevention from this disease. Studies have also suggested that some dietary factors can also increase the risk of developing this disease. The main finding here is concerning breastfed infants and infants that are receiving supplements of vitamin D. These infants are known to have reduced risk of type 1 diabetes development. On the other side, children with early exposure to cereal proteins and cow’s milk are at higher risk of developing it. The research on this subject is not strongly supported and additional information is needed if we want to clarify the effect of the infant nutrition on the risk of developing type 1 diabetes. Monogenic diabetes are relatively uncommon diabetes forms, caused by changes and mutations in some genes. These are inherited in most cases, but sometimes, this is not the case. These mutations of genes are known to cause diabetes. This is due to the mutations reducing the ability of the beta cells to produce the insulin the body needs. Other genetic mutations can cause type 1 diabetes as a result of damaging the insulin quality or its produce. This is done by causing insulin receptors abnormalities. Diabetes is shown to occur in people who suffer from other genetic diseases such as Klinefelter syndrome, Down syndrome and Tyrner Syndrome. These people are actually developing type 1 diabetes in higher rates than people who don’t suffer from the genetic diseases. It is still unclear if the genes are the factor that predisposes people who suffer from genetic diseases to type 1 diabetes. Other genetic disorders linked to diabetes are the cystic fibrosis and hemochromatosis. The first produces very thick mucus that blocks the pancreas. The second one causes too much iron produce in the body. If these two disorders are not treated, people may experience higher risk of diabetes as they age or, in the second case, the iron may build up and damage organs, including the pancreas. The pancreatic beta cells can be greatly damaged in cases of cancer, pancreatitis and trauma to the organ. These can impair the production of insulin and become one of the things that causes type 1 diabetes. Sometimes, the pancreas is too damaged that it needs to be removed, so the beta cells loss leads to development of diabetes. The organs that produce hormones for the body are affected by endocrine diseases. These hormonal disorders such as Cushing’s syndrome and acromegaly can cause diabetes. This is done by inducing the resistance of the insulin. Cushing’s syndrome is linked to excessive cortisol production. Acromegaly is a condition when the body produces grand amounts of growth hormone. Another endocrine disease is glucanoma. This is a pancreas tumor known to cause diabetes. The reason lies in the fact that the tumor produces too much glucagon. There are a few rare autoimmune disorders that can disrupt the insulin action. These are characterized by such antibodies that can lead to development of diabetes. The diabetes in these cases is commonly associated with lupus erythematosus and stiff-man syndrome. There are many chemical toxins that can destroy beta cells in animals. However, only few chemical toxins are linked to development of diabetes in humans. Lipodystrphy is a condition when the fat tissue is either redistributed in the body or completely lost. It is known to be associated with the insulin resistance and diabetes. Diabetes is a complex autoimmune diseases and there are plenty of causes connected to its developments. Many scientists now believe that environmental factors and genes are the most common causes for this disease.